From diapers to diamond rings, if it can be bought, chances are you can get it through a 5.5” screen. Take a moment to observe the people around you the next time you’re out. Whether you’re on the subway, at a coffee shop, or just walking down the street, it won’t take long to notice a pattern: practically everyone is on their phones, looking at the latest pair of Air Jordans or sweet sounding headphones they’ve been saving up for. With mobile shopping becoming so popular, it’s more important than ever to make sure that your ecommerce app breaks away from the competition. To start, we’ll cover what makes an ecommerce app successful, with a focus on app tried-and-true ways to drive awareness and user acquisition. Mobile commerce is expected to account for 54% of total ecommerce sales by 20211. All the time and effort you’ve spent on your app is futile unless you have a foolproof customer acquisition strategy. To understand how to get app acquisition right, look no further than fashion retailer ASOS. With £4 billion in net sales, it’s a dominant player in the ecommerce space — due in large part to its wildly successful mobile app with over 10 million downloads. 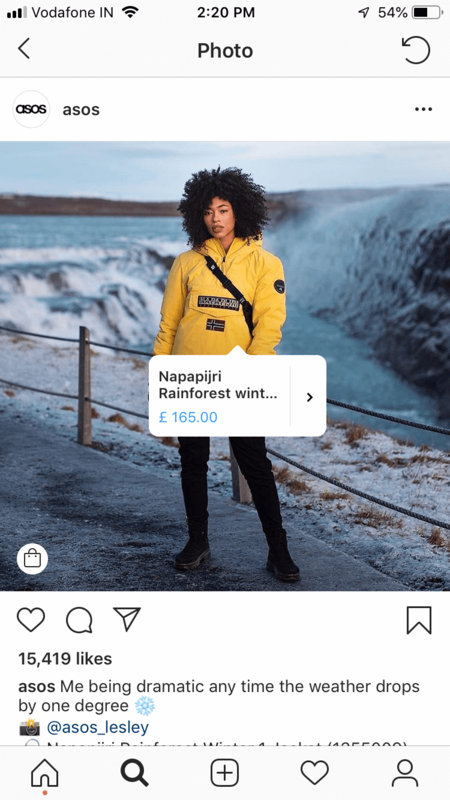 One of the biggest reasons ASOS excels at user acquisition and awareness is it’s ASO, App Indexing, and social media strategy. They do an amazing job at getting the basics right, and then adding their own special twist — making the app easily discoverable for anyone who’s interested in shopping for fashion on a mobile device. First, we’ll focus on how ASOS excels at ASO. When picking the main title of the app, it is recommended to pick keywords based on relevance, difficulty, and traffic for your main title that reflect your app’s industry, core utility, or benefit. However, ASOS chose to distinguish itself by choosing a name that is exceptionally unique, memorable, and easier to rank. ASOS stands for “as seen on screen,” because you can shop anything you see while perusing the company’s Instagram or YouTube channel. Given how fast fashion is evolving — and how social media is dictating the latest style trends — the name couldn’t be more relevant (or distinct). 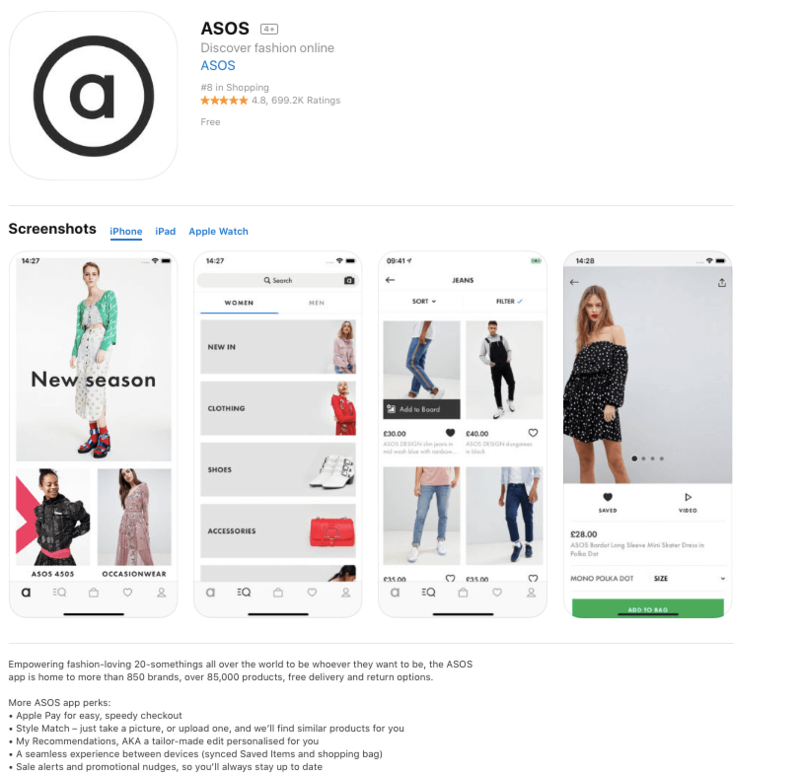 By focusing on relevant keywords like “Shopping”, “Clothing” “Marketplace”, “Brands”, “Fashion”, “Catwalk”, “Misguided” and “Zara”, reflective of their core product, USP, and main competition, ASOS has been able to drive a huge amount of traffic to its app store pages on Android and iOS. ASOS does a great job of updating its app store page with relevant information about features and new releases. It has over 10 million active downloads across the globe on Android alone. Don’t panic if your app doesn’t have 10 million downloads. Every download you get improves visibility. And newer apps can outrank established players with a higher download rate. That means if you have more downloads this month, you can still outrank major brands. 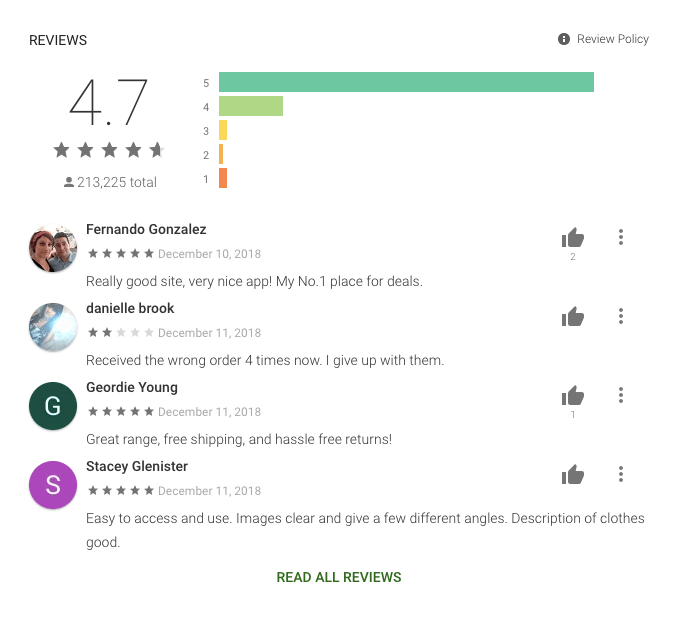 Ratings and reviews have a significant impact on app discoverability, and influence other users to download it. In the above instance, a high average app rating of 4.7 for ASOS is additional motivation for users to download the app. The reviews they receive are due to the exceptional user experience it provides, with the additional advantages of free shipping and an extensive product catalog. Once you’ve managed to get people to discover your app page within the app store, you need to make sure you clearly communicate the value you provide to the end user. This is where you include a brief description of the app’s main features and benefits. Highlight things like speedy checkout, visual search, designer collections, and other differentiators, along with walkthrough videos and screenshots of the app. It is also important to include details of the app version as well as the date of the last update. Users are more likely to download an ecommerce app that is maintained and updated regularly. Google and Apple Spotlight Search, the dominant search engines on mobile devices, now rank app content in addition to website content. Search engine robots explore the pages within the app using deep links. This process is called app indexing. This is a great way to potentially double your SEO — since you’re providing links to your app in addition to your website. So in effect, you can expect an additional influx of organic traffic to your app as well as your mobile site. Results obtained through app indexing actually are prioritized above regular web results, by both Apple and Google. So without an app, it will become almost impossible to rank on page 1 of mobile search results. 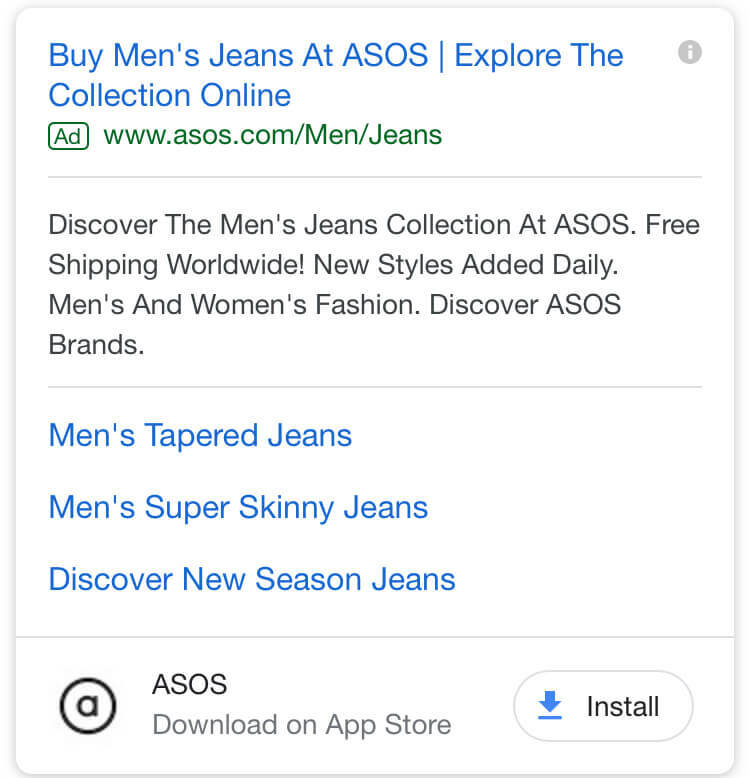 Here’s an example of how ASOS manages to feature in top search results and nudge mobile users to install the app through Google Ads. For mobile users who have installed the app, deep linking allows users to discover products directly in the app through their search engine results. With the average person spending over 2 hours a day on social media, you have yourself a win-win situation that allows users to feel more connected to your app. No other ecommerce app has been able to match ASOS when it comes to social media. It maintains a strong presence on most social sites — and not just the usual suspects like Facebook, Twitter, and Instagram, but also Pinterest and Reddit. With branded hashtags, shoppable looks on Instagram, and a thriving influencer network, social media is one of their biggest user acquisition channels. Over 50% of ASOS users are on mobile, and there’s a reason why. With mobile-only features like visual and AI-driven search, mobile payments, and a fit analytics function — their app users know a lot of effort has been put into making the mobile experience superior. 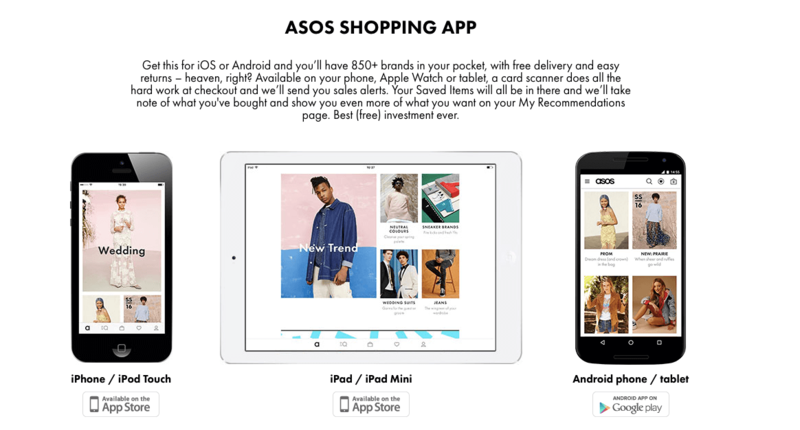 And for users who are still on the website, ASOS provides a simple clickable link that directs them to the respective Android or iOS app store from a landing page that communicates the app’s value proposition and features. Apart from some of the best practices listed above, it’s important to identify the various user segments and tailor your acquisition strategies accordingly. Here are a few tactics that will help you improve awareness and user acquisition for your app. Search Engines – Google, Bing etc. Run campaigns on days 1, 3, and 7 post download to inform new users about core features. Share sales, discounts, and promo codes to encourage a first conversion. Once you have some key strategies for improving app awareness and user acquisition for your ecommerce app, you need to monitor its progress to see if it’s working. Here’s the list of key metrics that will help you gauge your success and keep upping your game. Improve your search ranking for both search engines and app stores to improve the chances of app discoverability, download, and adoption. Influenced by the number of downloads, app store rankings, and reviews. The amount you pay per installation of your app on a user’s mobile device through a paid ad campaign. Successful app awareness and user acquisition is necessary for your app to become a market leader. Getting the fundamentals right is key, and spending your time and resources in adopting these industry best practices is what will make your efforts in building a great app worthwhile. Stay tuned for my next blog post where I’ll cover how you can implement a dynamic user onboarding strategy for your ecommerce app. 2018 Benchmarks for Travel Apps: Where Does Your App Stand?